It might not be very pretty but it sure was good and it was a good way to start off the week. The whole cake gone in less than a day, it was that good! 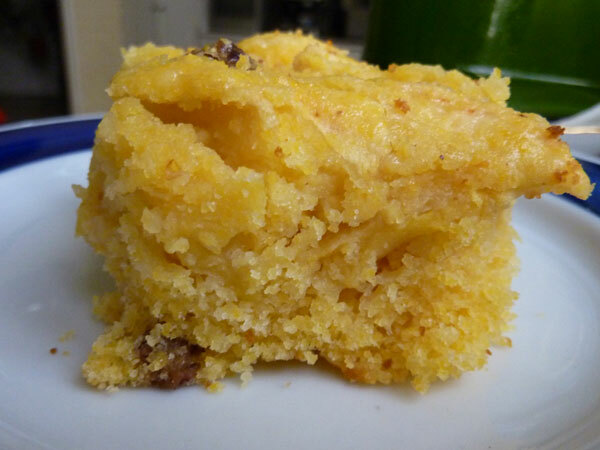 It is a sweet cornbread with apples and raisins added, experiment resulting from trying a basic cornbread recipe and sometimes adding mashed bananas and walnuts, very good as well, and this time I tried apples. Great for breakfast or a snack. Not too moist, not too dry, just perfect. Try it and let me know if you like it as well. Heat oven to 450°F (230°C). Mix the dry ingredients, then add the egg, milk and oil and mix well. Add the sliced apples and raisins if using. In a 8″x8″ cake pan, pour the whole mixture. Bake for 20-25 min.